Your baby has got a high temperature and you got worried? Don’t be!!! Fever in babies is not a very dangerous thing, unless your baby is a newborn. Nevertheless, babies become cranky and fussy when they have a fever and God help you if it’s due to cold. However, if your baby has a flushed cheek and is radiating heat, it may not be the fever or any underlying infection. Babies’ temperature can rise due to various reasons such as teething, physical exertion, warm weather, warm clothing or even a warm bath. 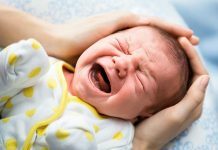 We have compiled 5 facts about fever in babies that you didn’t know earlier. If your digital thermometer reads a temperature of 99.9° F, it doesn’t count as a fever. A rectal temperature if it’s below 100.4 degrees is considered normal in babies. Unless the rectal thermometer reads 100.4° F or higher, your little one does not has a fever. If you didn’t know, body temperature in babies also changes according to the time of the day, rising in the late afternoon and dropping in the early morning. Viral fever tends to go away in 2 – 3 days. Antibiotics are not prescribed in viral illnesses as they have no effect on viruses. When the baby’s immune system is fighting off an infection such as intestinal, common cold, or flu, it causes fever. Bacterial infections are less common than viral infection but are serious in nature. Antibiotic dosage is must for bacterial illnesses and complete treatment is highly advised. Bacterial fevers are caused by bacterial infections such as ear, urinary tract infection, bacterial pneumonia or bacterial meningitis. Your baby is younger than 3 months and has a fever. If the rectal thermometer reads a temperature above 100.4 degrees. If the fever lasts longer than 24 hours when your baby is younger than 2 years old. When the baby is 2 years or older and the fever lasts more than 3 days. If the baby’s body temperature frequently rises above 104 degrees. 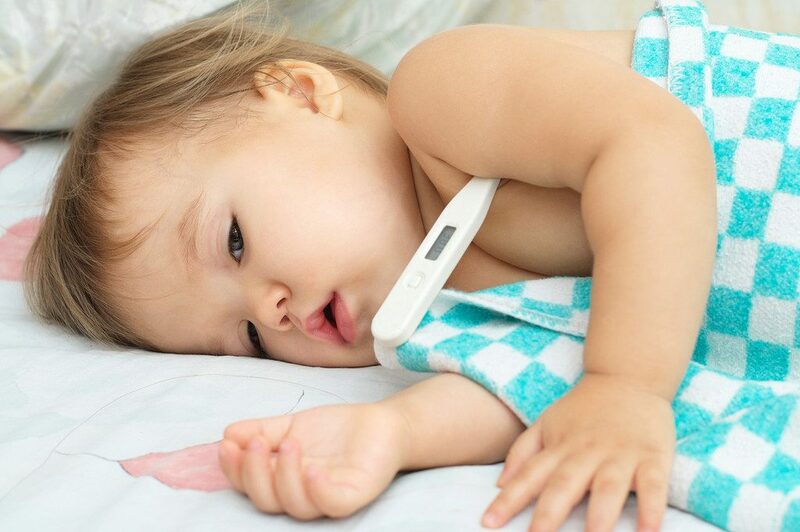 Although, it is not the normal way we use to measure a baby’s temperature, digital rectal thermometer shows accurate reading for body temperature in babies as well as in children below 3 years. Underarm readings, forehead readings and even ear thermometers aren’t as accurate as rectal thermometers. However, make sure that you use a digital instead of glass rectal thermometer. If the glass breaks or is damaged, the toxic mercury could harm your baby. Seek medical help immediately if your 3 months or below old baby is running a fever of 100° F or above. According to American Academy of Paediatrics (AAP), there are two reasons why you need to call the doctor immediately – first, the bacterial infections can easily cross the blood stream due to the thin layers of cells in babies and affect the central nervous system. It can cause immense damage. Two, unlike older babies, infants don’t show complete symptoms of severe infections. So, even if a baby develops a blood infection (Sepsis), he might not show any symptoms at all. If it’s a viral fever, there’s no need to worry. However, you may not be able to distinguish between the two with physical examination. Blood and urine test or stool test are done to determine the cause. An infant below 3 months may also need to do a test for meningitis, a very serious yet uncommon infection of the brain and spinal cord. Fever will definitely not harm your child’s development or neuro system. Even the febrile seizures that happen due to sudden temperature rise is often harmless. Although reducers can bring the temperature down, they don’t prevent the infection. Therefore instead of treating the fever, treat the cause of the fever or the symptoms. 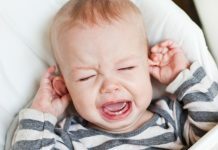 And moreover, fever is actually a sign of a strong and fighting immune system; so don’t let the anxiety creep in when your baby is warm and irritated. Of course, do call the doctor if the fever last unusually longer; otherwise it should go away by its own. Notes: In rare cases, during febrile seizures babies may accidently swallow saliva or vomit, which may cause aspiration pneumonia. Heat strokes can be confused with fevers. Make sure you don’t overdress your baby or leave her in closed cars, even just for a minute. Next articleAre Baby Blues and PPD Two Different Terms?